After the last leaf falls from the trees, most homeowners believe they are finished thinking about their gutters for the year. Sadly, this is not true. Winter weather can severely damage the gutters of your home and eventually lead to roof damages and thousands of dollars of repairs. 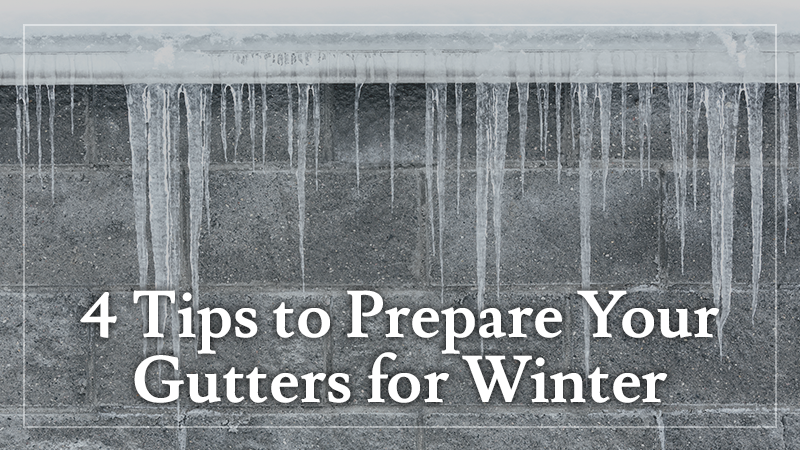 These four tips will help you maintain your gutters properly this winter and save you money. While slow draining gutters may be a pain in the warmer months, they can cause expensive repairs in the winter time. 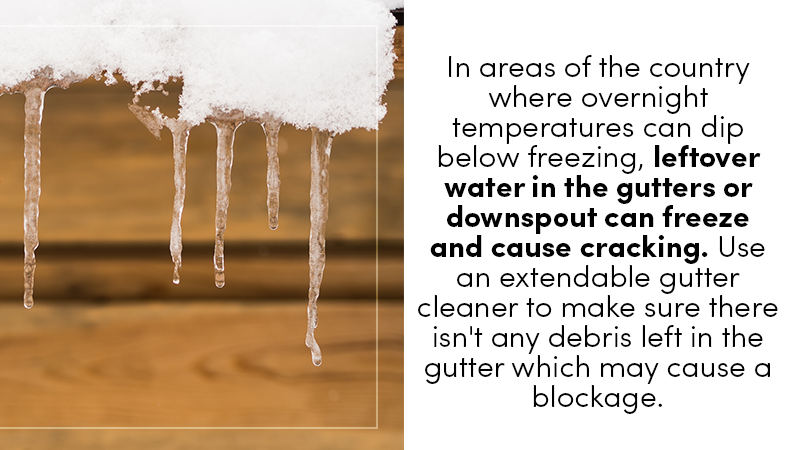 In areas of the country where overnight temperatures can dip below freezing, leftover water in the gutters or downspout can freeze and cause cracking. Use an extendable gutter cleaner to make sure there isn’t any debris left in the gutter which may cause a blockage. It is a good idea to test your gutters using a garden hose to make sure they are clear. Over the years, debris, weather, and age can cause gutters to bend downwards. Not only does this make your home look unsightly, but it can also significantly decrease the gutter’s effectiveness to drain. Gutters should have a one-half inch slope for every ten feet of the gutter to allow for the best drainage. Ensure the lip on the exterior edge of the gutter is not bent or cracked. While you are checking your gutters for the proper pitch, take a look at the hangers and seams. Hangers are the part of the gutters that you attach to your home with screws. Test the screws to make sure they are tight and look for any signs of the gutters beginning to pull away from your home. Check the seams between each section of gutter and especially at each corner of your home to make sure they are still firmly attached. The downspouts on your gutter help to carry the water away from your home. When a downspout is not working correctly, water can collect near your home’s foundation and cause structural problems and leaking. When you check your downspout, first determine whether the downspout fits solidly into your gutter without any spaces. Next, look at how the downspout connects to your home — it should be secure. Finally, ensure the downspout carries runoff far enough from the home to prevent damage. Climbing to inspect your gutters is dangerous, and it is never a good idea to climb a ladder by yourself. The best option is to leave your winter gutter maintenance to the experts. For over a decade, L&L Contractors has been serving the residential and commercial construction needs for the residents of middle Tennessee. Whether you need a new window or a new addition, L&L Contractors can help. Schedule a free consultation by calling 615-617-3189 today.